This is an interesting, inspiring book about a doctor who devoted his life to helping children. Korczak was born in 1878 in Warsaw, Poland. Though his parents were well off for part of his childhood, Korczak was very aware of the poverty and suffering of other less fortunate children in Warsaw. When he was 11 years old, his father became ill and his family began to struggle because he could no longer work. Korczak tutored to help out and when he went off to university, he knew he wanted to devote his life to helping children as a doctor. The orphanage was opened in 1912 and was very democratically run. For example, the children governed themselves, decided on punishments, and participated in discussions about problems that were encountered within the orphanage. But Korczak also believed children should have fun. He always told them stories, and played games with them. Every summer, the kids went to a camp in the countryside. Korczak also wrote and published books for children and adults, his most famous being King Matt the First. When the Nazis invaded Poland and forced all Jews to live in the ghetto they had created, Korczak , his staff and his orphans were forced to live in a single crowded room. Life was difficult and the children became thin and sickly. Korczak would roam the streets of the ghetto, scrounging around for food, medical supplies and anything else they might be able to use. In honor of Korczak’s work, the United Nations declared 1979 the International Year of the Child. 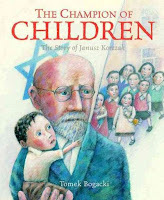 The United Nations Convention on the Rights of the Child, created in 1989, was strongly influenced by Korczak’s theories. Bogacki both wrote and illustrated this beautiful picture book depicting the life of Janusz Korczak. He was influenced by stories his grandmother had told him about this remarkable doctor. Thanks for the recommendation. This does look interesting, giving us another look at WWII with a different perspective. This is my first time to your site and like the titles you are reviewing. A couple of new ones for me as well as some of my favorites. Thanks, Tammy, I am glad you like my site and the choices I have made so far. I hope you will come back. By the way, I like your site too. I found you through Nonfiction Monday. So glad I landed on your blog. It's just what I need to broaden my awareness about WWII. I've researched a small school in NC, interviewed numerous former students and found all kinds of homefront stories. I was amazed at what the school children did for the war effort. Welcome, I am glad you found my blog. I hope it is helpful. Your research sounds very interesting. I know what you mean about school children participating in the war effort. I have gone through numerous magazines from the war and there are always stories about kids in them.